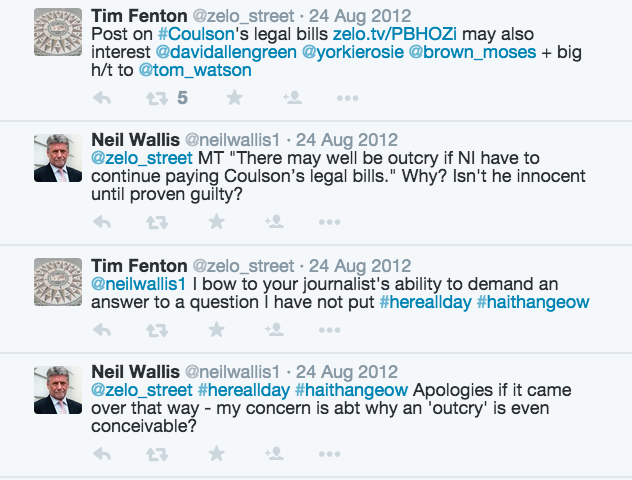 Neil “Wolfman” Wallis, former deputy editor of the Screws at the time Andy Coulson sat in the editor’s chair, and the paper was indulging in phone hacking on an industrial scale, has today been acquitted of conspiracy to hack phones. He therefore leaves court a free man, and with no stain on his character. The jury were not convinced, on the basis of the evidence put before them, that Wallis knew about hacking. 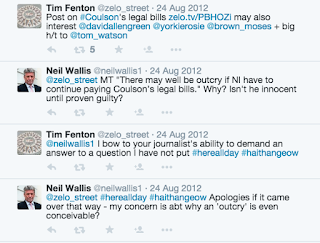 This, to some, may appear eyebrow-raising: after all, one might wonder how Wallis could function as a deputy editor and not know how all those stories were, if not obtained in the first place, made to stand up. But he maintained his line - that he didn’t know about all the misbehaviour - to the end. He had not heard a voicemail played to him. It was, in the retelling, a political witch hunt. His former colleagues were quick to comment. After Wallis took to Twitter to declare “Thanks so so much to all those who stood by me - so grateful”, one of those voicing support for Wallis was former Daily Mirror editor Piers Morgan, who told “Thrilled for @neilwallis1. One of the best journalists I've worked with. A good man who's been through 4yrs of hell”. 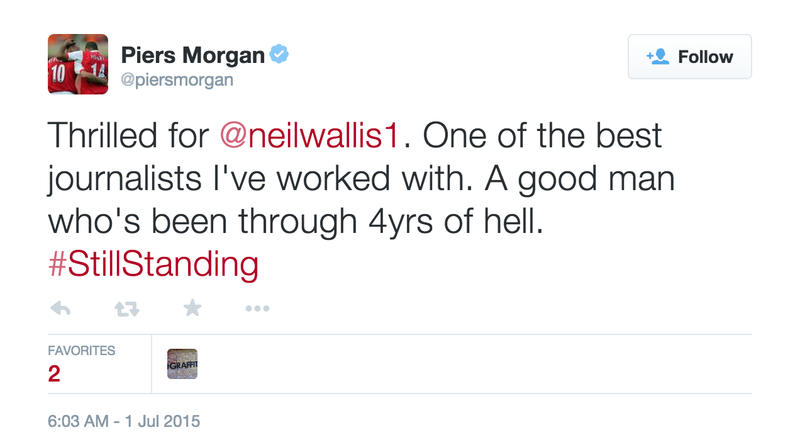 It’s good to see Morgan confirm that he and Wallis have in the past worked together. 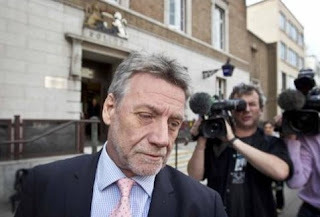 When Morgan testified before the Leveson Inquiry, as the Guardian noted at the time, “the inquiry's lead counsel, Robert Jay, pressed Morgan to provide more details about who had played him a voicemail left for Sir Paul McCartney's former wife Heather Mills. Morgan wrote about the incident in the Daily Mail in October 2006 … Morgan refused four times, saying on each occasion that he could not risk identifying a source”. 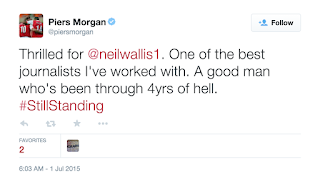 The source - the person who played Morgan the voicemail - was claimed by Private Eye magazine to have been Wallis. Now, the Eye could have been wrong, and if so, it would not have been the first time. Or the magazine may have wanted to protect its own source. 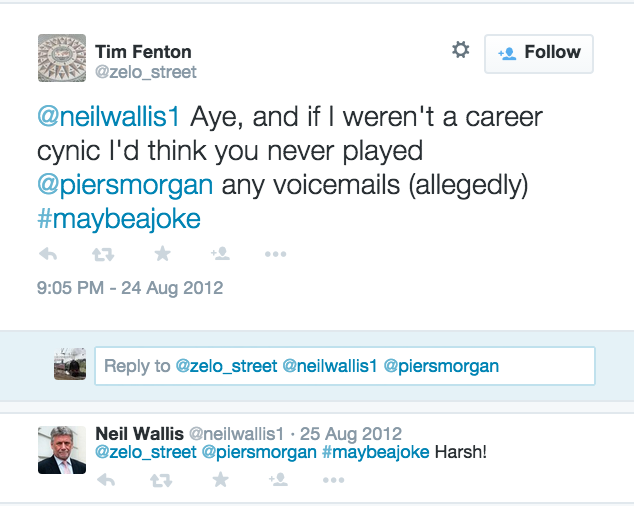 But Wallis’ Twitter exchange with me almost three years ago suggests some knowledge of the idea of him playing Morgan voicemails. Consider the Twitter exchange (link HERE) that is reproduced in this post. Note that Wallis is not tagged in the original Tweet; he engages in dialogue of his own volition and without prompting. 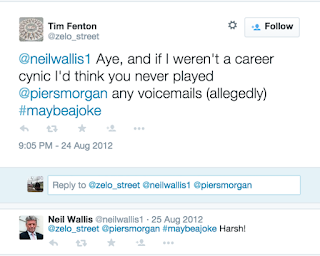 After some to-and-fro on the subject of his old boss Coulson, I tell him “Aye, and if I weren't a career cynic I'd think you never played @piersmorgan any voicemails (allegedly)”, to which Wallis simply responds “Harsh!”. 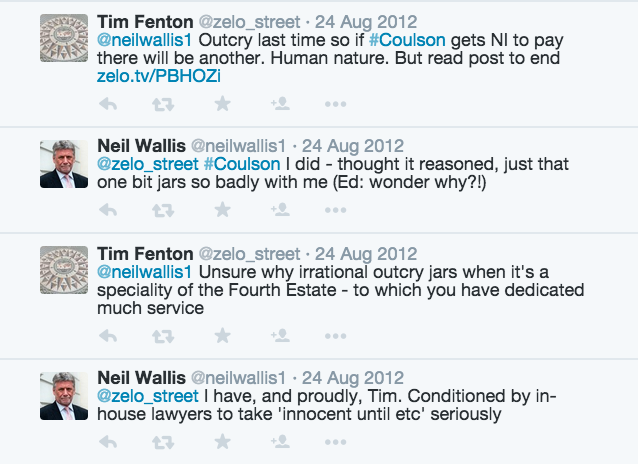 Neil Wallis does not ask me to explain myself. He does not offer a denial. One might reach the conclusion that this was a matter with which he was familiar. And, of course, he was not being charged on any matter to do with his time at the Mirror group titles. 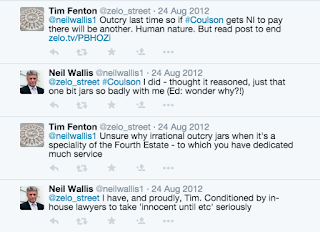 As his trial is now over, and there is no further contempt risk - or risk of him getting guilty - I let this one lie on the Zelo Street file, and allow others to draw their own conclusions. The days of phone hacking are hopefully over. Thank goodness for small mercies. Tim, Which Screws puppet was it who blamed the Womens Institute for its demise? Funny enough, I thought it was Rupe who dropped the hammer. But maybe I got confused along the way.